While cleaning floors can be a pain in the applejacks (and back), it certainly isn't rocket science. 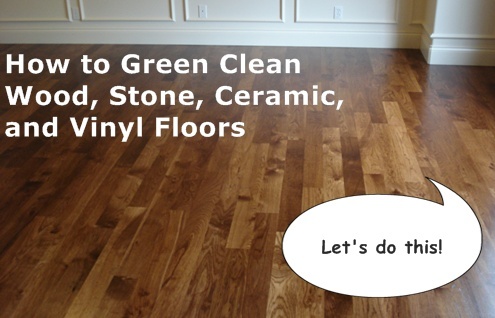 There is really only one thing to consider when choosing a green clean solution for you floor: the surface. Here are a few different methods for cleaning floors, sorted by the type of material the floor is made of. Untreated hardwood floors are the gremlins of the floor world, don't get them wet! Just dust mop or vacuum them and call it a day. Sorry! If your hardwood floor is treated with polyurethane, wax, or something else you've got the green light. The way to tell the difference between treated and untreated wood floors is to spill a few drops of water on the floor. If it beads, the floor is treated. If it gets absorbed, the floor is untreated. I love Dr. Bronner's Sal Suds. It smells woodsy and a little goes a long way. Bronner Mom Lisa Bronner recommends adding 1/2 T of Sal Suds to a bucket of water*. Melissa Maker of Clean My Space recommends adding a "pinky nail" worth of dish detergent (which is a great neutral pH cleaner) and a cap full of white vinegar to a bucket of water. Check out her awesome video on How to Clean Hardwood Floors. Sarah at Nature's Nurture used a combo of vinegar, water, rubbing alcohol, and essential oil to make a natural all-purpose floor cleaning spray to pair with the Swiffer she repurposed into an eco-mop. There are a bunch of hardwood floor cleaner recipes at TipNut too. Wellness Mama writes that you can bring shine back to wood floors by rubbing a mixture of 1/2 c white vinegar and 1T vegetable oil into it. Aren't we fancy! If you have marble floors you need to use a neutral cleaner. Dish soap is a wonderful choice. Add up to three drops of the stuff to a bucket of water. Mop the floor. Then be sure to dry. Do not use vinegar cleaner on stone surfaces. Mix 1/2 cup white vinegar or 1/2 T Sal Suds in a bucket of water. Mop. Wipe dry for shine. If the grout is really dirty, try using a brush and scrubbing with Bon Ami or washing soda then rinse well with plain water. Mix 1/2 cup white vinegar or 1/2 T Sal Suds in a bucket of water. Mop. There's no need to wipe dry. *All references to a "bucket of water" in this post mean about one gallon of water in whatever container is easiest for you. It could be a bucket, but trash cans and sinks work too. I love microfiber mops. I described what they are and how to use them in my blog post about alternatives to Swiffer, so check that out. Regardless of the solution you use, wring out your mop thoroughly before cleaning the floor. I also recommend drying the floors after cleaning by going over them with a dry mop head or towel.